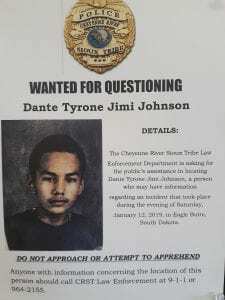 The Cheyenne River Sioux Tribe Tribal Police and Rapid City Police Departments announced the apprehension of sixteen-year-old Dante Tyrone Jimi Johnson at a gas station on LaCrosse street in Rapid City Saturday morning. Local citizens were on edge throughout the week as authorities looked for the individual or individuals responsible for the fatal shooting of Marcus Antonio of Eagle Butte, SD. Unofficial reports and accounts identified Johnson as the possible shooter in the incident. There are no official reports that suggest the actual shooter has been apprehended. The investigation is ongoing. Eagle Butte has seen several murders involving fatal shootings and stabbings resulting from disputes between young men within the community in the past four years. In each case, the accused and the victim knew one another, and in several cases attended school together. Austin Miner was fatally stabbed in June 2015, East Lee was fatally shot in Oct. 2016, and Andrew Frost was fatally shot in Nov. 2017. Local community members have held marches for justice in these incidents, as well as in the disappearance or unsolved deaths of other CRST residents. Concerns for the safety of citizens have risen in light of these incidents, and in connection with speculation that the meth epidemic on the reservation may be in part to blame for some of the violence. Flyer released Thursday, Jan. 17 by the CRST tribal police department about local teen wanted for questioning in fatal shooting of an Eagle Butte man.